Is Low-Code Enough to Build Enterprise-Class Apps? The rapid rise of low-code development tools is enough to leave many developers’ heads spinning. This is especially true as the early days of low-code app development were marked by simplistic, user-created apps. For example, having a lunch room manager create an app to notify users of daily menus and letting them provide feedback is a simple use case for a low-code app. These types of solutions are useful, but most developers aren’t going to consider them vital to the enterprise. As low-code apps have evolved, many industry stakeholders have been wondering if this category is ready to handle true enterprise-class apps. The simple answer is a resounding yes, but it is essential to remember that not every low-code platform is the same. App development platforms have emerged largely due to the demands of digital transformation. A Computer Business Review report explained that the sheer complexity of digital transformation has left many businesses struggling to complete projects from start to finish. This has created demand for technologies that simplify development, streamline release processes and interconnect diverse stakeholders to allow for greater collaboration. Low-code platforms allow business and technology users to work hand-in-hand to solve problems by creating apps with the need for either minimal or, in some cases, no coding. Computerworld echoed this point of view. Analyzing research from Gartner, the news source said that app development platforms are gaining considerable momentum because of the need to roll out apps and services on a variety of device types. Supporting desktop, web and mobile, something that is already overwhelming due to operating system diversity, isn’t enough in the era of wearables and the Internet of Things. Organizations need to get mobile-ready apps into production quickly, and app platforms provide the functionality to do so. Low-code platforms are, in essence, the infrastructure necessary for digital transformation. Users are increasingly demanding apps and services that get them data when and where they need it, and traditional development methodologies aren’t responsive or collaborative enough to support this demand. Low-code systems break down longstanding barriers through a visual development interface that enables users to drag and drop modules based on functionality to create quality apps quickly. In some cases, a bit of programming is required on top of all this to allow for integration. However, leading low-code platforms provide the underlying data and process management functionality organizations need to minimize coding while creating powerful enterprise apps. Low-code platforms can provide a base for enterprise-class app development. 1. 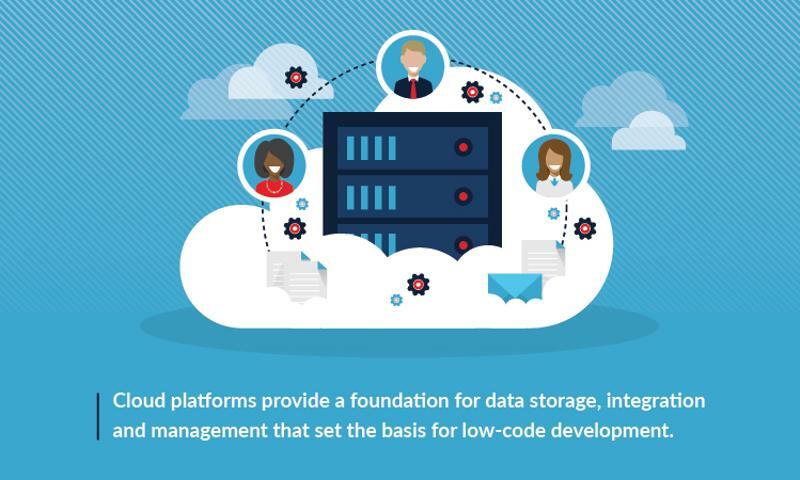 Housing the low-code ecosystem in a cloud platform: Cloud platforms provide a foundation for data storage, integration and management that set the basis for low-code development. Within a platform, IT leaders can establish rules for how data moves, who can access what systems and even what types of login credentials will be required for different apps. With these baseline capabilities defined in the backend and automatically applied to all apps built into the platform, organizations get the data workflow and governance controls they need without having to manually program each app with unique code. 2. Incorporating business process management into the platform: Business process management functionality is increasingly being built into leading digital transformation platforms so businesses can create, refine and roll out new processes at-pace with the changes happening in their markets. Essentially, the platform serves as a hub where the rules and communications needs within any process are housed and applied to data and applications by default. 3. Leveraging connectors and APIs: Moving data between apps and services is becoming easier due to the emergence of connectors and APIs that effectively bridge different solutions allow information to flow freely. Whether you need to connect a legacy app to your cloud apps so the legacy solution gets data updates or if you need to get social media notifications built into a customer service app, that’s possible. APIs and connectors can be dragged and dropped into low-code apps, allowing for easy connectivity between solutions and streamlined data workflows. In many cases, enterprise apps need to become more like consumer solutions. Users demand high levels of performance, intuitive interfaces, flexibility and accessibility across a wide range of devices. IT teams, on the other hand, need the backend control and rigidity of classic enterprise solutions. Low-code platforms bring these requirements together through backend tools that give IT teams control and front-end development interfaces that allow for the rapid delivery of powerful apps. Appian is leading this charge, and our low-code platforms are fueling digital transformation in some of the world’s largest businesses.